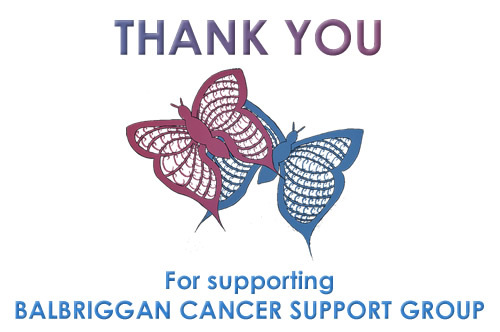 On behalf of Balbriggan Cancer Support Group I to thank all the participants in our annual 1/2 Marathon /10Km Run /walk. The event was a huge success and raised much needed funds to ensure the smooth running of our support centre. I would like to offer a very sincere thank you to Maria McCambridge and Gary Crosson for taking part in the event and taking part in the prize giving and medal presentation. As with any event the work of the stewards is paramount and to all stewards,including all new stewards and the hardy annuals Motor Bike riders and the staff at Balbriggan Cancer Support Group a heartfelt thank you .A very big thank you to our sponsors Balbriggan Crash Repairs, Tayto Park, Progressive Credit Union, Clarion Hotel Group and Balbriggan.info. A big thank you to the residents of the area of the run who have been very supportive. The next big event on the Balbriggan Cancer Support Group calendar is the Stephen Roche 3 County (80km) + 2 County (50km) Challenge. If you have a couple of hours to spare and can help out please email tomas.quinlan60@gmail.com or call 01 8410116. Once again, volunteers are vital to the success of this event – any support is greatly appreciated.